A loan of $10,000 helped us set up for production at our new location and expand our farm. Margaret De Bona and Tracy Potter-Fins met in Tivoli, NY, weeding and harvesting for hours and hours together at Hearty Roots Farm. Margaret grew up in the mountains of Western North Carolina and has worked on various farms in Connecticut, Oregon, and New York state. She is a seamstress, artist, hiker, and master naturalist. Tracy grew up in Moscow, Idaho and farmed for three summers in NY state after traveling abroad and working on small organic farms in Europe. She is a baker, sheep shearer, spreadsheet enthusiast, and country two-step fanatic. We’ve been farming here in Montana since 2011, successfully growing and expanding our business each year. After 6 wonderful years leasing land in Dixon, MT we bought our own 10 acres in Huson and moved in the fall of 2016. We are so excited to establish our permanent presence in Western Montana as an accessible, high quality, organic farm. It allows a farm to complete important operation projects on their new space of land. County Rail Farm is located in Huson, Montana, established by Tracy Potter-Fins and Margaret DeBona in 2011. We farm on a small and intensive scale: in 2016, we cultivated one acre of produce, employed two full time workers, and grossed over $70,000. We exceeded our goals and managed to build a greenhouse and prepare ground at our new location this fall. Our produce is available at restaurants and grocery stores via the Western Montana Growers Cooperative and at two Farmers’ Markets in Missoula. County Rail Farm is recognized by our name and logo throughout Western Montana: in grocery stores, on restaurant menus, at catered events, and (once) in Leonardo DiCaprio’s resort room mini fridge. Our unique branding allows our customers to personally connect with County Rail outside of the Farmers’ Market and has become a mark of quality produce. We were the first small operation to brand salad mix and arugula through the Western Montana Growers Cooperative for retail sales, which now make up almost half of our yearly revenue. We are Certified Organic by the Montana Department of Agriculture, Certified Montana Homegrown, and in 2015 we became one of five local farms to successfully complete Good Agricultural Practices certification, a national food safety program run by the USDA. We have also completed projects with the Natural Resource Conservation Service (NRCS) working with soil health and cover crop management. We pride ourselves on growing food in a way that improves and sustains the land we cultivate. We host a variety of on-farm events, providing our customers with a more personal connection with their farmers and the land. We are organized, smart, innovative, and passionate about what we do and we have successfully built a robust business over the past five years. We have moved to a permanent location and are expanding our operation and intend to build infrastructure and acquire equipment to farm two acres in 2017, three acres in 2018, and the option to grow into the 8 irrigable acres available in the future. We were recently approved for a large reimbursement grant through the Growth Through Agriculture program with Montana state for our relocation and expansion. Because this grant is reimbursement based, we need capital to start the projects named in the grant. Those projects include plumbing the warehouse ($5,000), building a deer fence ($9,500), building a cooler ($3,000), building a high tunnel ($9,000), and purchasing a variety of tools and equipment including flame weeder and greens seeder. We are asking Kiva (you!) for a $10,000 loan so that we can complete all those projects and hit the ground running for the 2017 season. Your loan will likely be paid back far before our final due date and you can be assured of return because all these projects are already approved for reimbursement! We are committed to making this new property an efficient and sustainable space for our operation. This Kiva Loan in combination with the Growth Through Agriculture grant will allow us to expand our business, set up infrastructure at our new location, pay our employees early in the season, and efficiently grow and distribute clean, organic, and sustainable produce in Western Montana. We feel extremely grateful to have had the last 6 years to establish a business and a market for our produce. Now County Rail has a permanent home, but moving and starting a new operation can be a stressful and expensive process. We are invested in making County Rail a sustainable source for value added organic produce, and providing a fun and educational space for the community for years to come. We hope that you will support us and invest in Western Montana's local food system. Thank you for your time and consideration! Why are you endorsing Tracy? 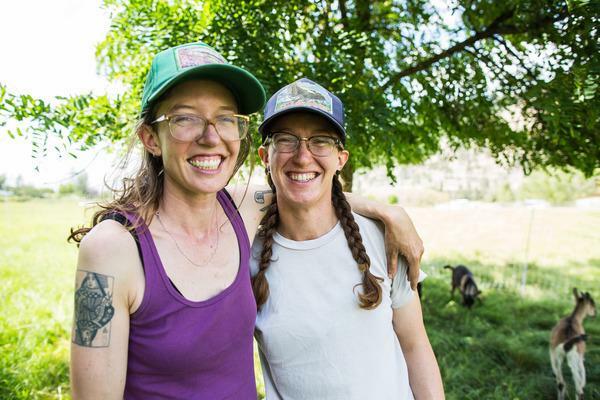 Tracy and Margaret have been running County Rail Farm for six years and through that short time have become leaders in the Western Montana agricultural community. Tracy is a past chair of the Montana Sustainable Growers' Union and both have been active in several farmers' markets as well as the Western Montana Growers' Cooperative. We think this loan is an excellent use of funds and will have quick payback for lenders. We are confident in Tracy and Margaret's character and intent to repay this loan.